Shortly before Thanksgiving, I alerted my buddy Steven to a Black Friday sale at the Portland Timbers team store. The first 20 fans through the gate at 6 a.m. would receive a free jersey and a grab-bag full of team memorabilia; everyone who showed up would score good deals on merchandise, free coffee, and treats from Voodoo Doughnut. I figured we would wake up with the rest of the crowds on Friday morning. He had other ideas, suggesting that we camp out overnight. Sensing the potential for a good story — and the allure of a free jersey — I went along for the ride. What follows is a running diary. But first, we met at Walmart, where our story began. 9:15 p.m.: I expect to meet Steven, who’s angling for an iPad that goes on sale at 10 p.m., but he’s en route. In the meantime, I’m surprised by how desolate the store is. I’m alone in the aisle, hopeful about the lack of angry uncles and grumpy grandmothers. Has Black Friday jumped the shark? Has society decided that Thanksgiving night is too early for sales? Have we declared that the holiday should remain the sole domain of families and loved ones? No. I took a wrong turn at the entrance and am in the cereal aisle. 9:30 p.m.: I must be the only person who’s not buying something tonight. It is a strangely freeing realization. When a cart blocks the aisle, I take a detour without worrying that I’ll miss out on the last HDTV or a cheap copy of Candyland. Groups of friends and families map out the store and choreograph routes to each item on their lists. They slink through the aisles and around displays like seasoned NFL running backs. Generals in Iraq laid out less intense, less precise battle plans. I’m sure of it. 9:35 p.m.: Steven is nowhere to be found, so I wait for an iPad on his behalf. I find my spot at the back of the 75-deep line and overhear that the first person arrived four hours ago. I was still noshing on pumpkin pie at 6 p.m. Such a slacker. 9:45 p.m.: We’re sequestered in line and, according to an associate, guaranteed an iPad. With that announcement, everyone in line takes a deep breath. People share tips about hot deals and swap battle stories. We hear squeaky cart wheels and elated whoops a few aisles away, so our line feels like a quiet park in the midst of a bustling downtown. 10:04 p.m.: An associate should have wheeled out the iPads by now, but we’re still waiting. The crowd turns restless. “It’s five after 10,” one man says. “Do you guys know how to read time?” Another lady says, “Let’s go” to no one in particular. So much for the calm and quiet. 10:30 p.m.: Steven arrives and secures his iPad. Our business at Walmart complete, we drive to Jeld-Wen Field, home of the Timbers — and their team store. 11:35 p.m.: We arrive with several layers of clothing, a portable propane-powered heater, and a pair of camping chairs. Steven and I are fifth and sixth in line, immediately behind two brothers. One is earnest and friendly; throughout the evening, we’ll talk about his career as an engineer and holiday weekend plans. The other loudly proclaims that he’s in line only because his lady friend agreed to wear his free jersey … and only his free jersey. My first reaction is one of disgust; he’s an interloper in the Timbers Army, I think to myself. He’s not a true fan. My second reaction is considerably more primitive: That’s actually pretty hot. 11:40 p.m.: “Where’s a bathroom?” I wonder. No one knows; the closest open business is McDonalds, but its lobby is locked until morning. “There’s a dumpster over on that street,” one of the brothers tells me. “It’s pretty dead over there.” I opt to hold it. 12:15 a.m.: I’m a Pacific Northwest native, so rain should have been on my radar the moment this plan took hold. Yet I’m just now worried about getting wet. We’re uncovered, and I’m wearing three pounds of cotton. It’s dry for now, but I don’t forget for a moment that this is Portland in November. 1:10 a.m.: I take a walk, searching for somewhere to relieve myself. I pass the dumpster that one of the brothers alluded to, look up at the nearby condos, and see a few stray lights on. Suffering from stage fright, I keep walking. 1:15 a.m.: I must be a prophet, because I stumble upon the Bitter End Pub just around the corner. Remarkably, it’s open. I take care of business, slide up to the bar, and order a pint of Jubleale. While the foam dissipates, I savor the fact that I’m already breaking a sweat instead of watching for pedestrians from behind a dumpster. 2:25 a.m.: For the first time all night, I’m tired. I try dozing off in my chair, but nearby conversations and the occasional car keep me from falling asleep. My Grandpa used to fall asleep in his chair at holiday get-togethers with a dozen people around and a football game blasting from the TV; I don’t know how he ever did it. A handful of barflies stumble out after last call. A strangely aggressive woman asks what we’re doing and, without waiting for an answer, launches into a lecture. “I’m so sad for you,” she says. “I’m so sad for you.” One of the 10 people in line describes the free jersey and accompanying grab-bag. “Oh, that doesn’t sound so bad,” she says. “I’m a little less sad for you.” She lights a cigarette and walks home. 3:15 a.m.: Cold and exhausted, I warm up and try to catch a few winks in my car. I leave the heater running as I lean the seat back and immediately fall into the deepest sleep of my life. 3:35 a.m.: I bolt upright when I hear a pulsating car horn. The wilder of the two brothers is apparently mimicking Morse code with his car alarm right behind me. 3:55 a.m.: Why am I not comfortably in bed? Who waits nearly seven hours for a jersey? Am I any different than the bargain-hunters who skipped dinner for hot deals? Even if I get a good story, who’s going to read it? Why am I here? I do not know. 4:30 a.m.: Other, more productive ways to fill seven hours: Watch the first two “Lord of the Rings” films or the first two seasons of “Entourage.” Take a train ride from Seattle to Portland, get out, stretch, and ride back. Read “Harry Potter and the Goblet of Fire.” Sleep. 4:40 a.m.: Steven and I are too catatonic for conversation and too cold to nap. We might actually be too tired to sleep, if that’s even possible. We walk around the plaza outside the stadium every few minutes to generate some modicum of warmth, but there’s nothing else to do or say. Once upon a time, seven hours didn’t seem so daunting. The only saving grace is the continued lack of rain. 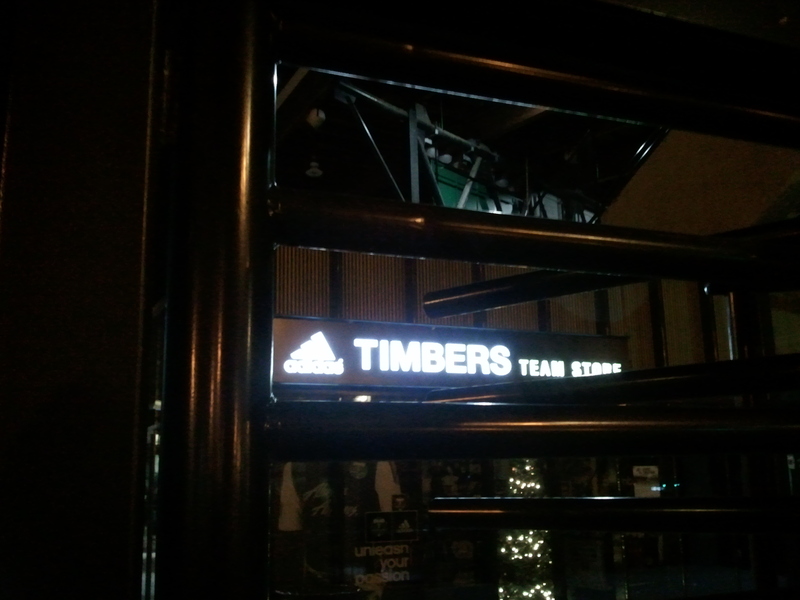 5:10 a.m.: A nearby Starbucks opens, providing a final jolt of energy before the Timbers store opens at 6. I indulge in a rare cup of coffee — only the third of my life — and am overwhelmed by the warmth radiating throughout my body. All misgivings wash away as I regain feeling in my toes. I unzip my jacket and consider proposing to the barista on the spot. 6:00 a.m.: An employee unlocks the gate and shepherds us into the warm, brightly-lit store. Thirty or so people crowd around hats, jerseys, and trinkets. Clerks put up discount signs over hoodies and jackets. They ask if they can help me find something. I stumble around with my grab-bag, skittish and overwhelmed. It’s an assault on my tired senses in a way that Walmart never was. The sensory overload isn’t unlike seeing the Las Vegas Strip for the first time. While the others sift through jerseys in one corner, I grab a doughnut and walk to the other end of the store, where it’s still deserted. I wait for the crowd to dissipate, enjoy the snack, and try to process the sudden rash of movement and chaos. I’ll dive back into the fray and find some new gear before too long, but for now, I’m hanging back. I’ve waited too long to hurry up now. Very nice writing here. Really enjoying your writing and reporting style.